Electron microscope is a type of microscope which is based on the same principles as the standard light microscope with the difference that it uses a beam of electrons rather than the light for imaging. But rather than the “source of light” it is the resolving power that sets electron and optical microscopes aside the most. Because electrons have much shorter wavelength than photons (light), electron microscopes achieve a much greater resolving power and resolution. At the same time, these microscopes can magnify a lot smaller specimens than the ordinary light microscopes. History of electron microscopes dates back to the early 1930s when the German scientists Max Knoll and Ernst Ruska developed the first microscope that uses electrons rather than the protons. Although Ernst Ruska was awarded the Nobel Prize for the invention of the microscope in 1986, the world’s first electron microscope had a limited value and was not suitable for practical use. The first practical electron microscope was constructed only in 1938 at the University of Toronto. One year later, Siemens constructed the world’s first commercial transmission electron microscope (TEM). Nevertheless, all electron microscope were based on Ruska’s early 1930s prototype. Transmission electron microscope (TEM). 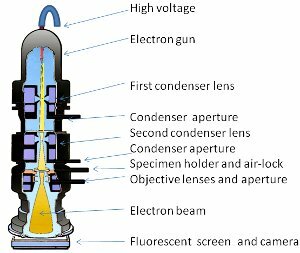 It uses high voltage electron beam and creates as much as thousand times better resolution than the ordinary light microscope. It creates two-dimensional black and white images. Scanning electron microscope (SEM). The first SEM was developed as early as 1937, however, this type of electron microscope did not become practically useful until the mid-1960s. In contrary to the TEM, the SEM does not produce an image of the entire specimen but of a narrow spot. The image of a complete specimen is produced by scanning over the sample in a raster rather than transmitting the electron beam through the specimen. And in contrary to the TEM, the SEM can produce an image of wet specimens and samples which are in a low vacuum. It also produces a good three-dimensional representation of the sample. Reflection Electron Microscope (REM). This type of electron microscope uses electrons that are reflected from the surface of the sample to produce an image. Scanning Transmission Electron Microscope (STEM). It is a type of TEM but it also incorporates the SEM technique as the electron beam is focused on a narrow spot. In a way, the STEM is a high resolution version of the TEM. Low-Voltage Electron Microscope (LVEM). This type of electron microscope is a blend of TEM, SEM and STEM with the difference that it uses low voltage which reduces the risk of damage to the sample. Electron microscope is used to create a magnified image of a variety of samples. It is an indispensable piece of equipment for biology, life sciences and research but it is also used in industry. Sponsered work is being undertaken by staff to produce a sample.